﻿ Panthera. A case of FIP? Panthera. A sad case of FIP? He was first seen in our feeding station about two years ago. He seemed to be about 8-9 years old and accustomed to humans. Sometimes he allowed a gentle touch but mostly he preferred to be left alone. He would eat, drink and then move on to pastures new...till next day or week, or sometimes even longer. We named him "Panthera", not just for his color, but also for his overall wild-animal posture. This June though, something was different with him. His belly was swollen, his movement was lethargic and he'd shown no signs of wanting to move on. His appetite was as good as ever, but it was obvious that something was seriously wrong with him. A couple of days after, and with his belly even bigger, I managed to lure him into a cage and took him to the vet. My veterinarian, a very experienced and animal loving professional, immediately sedated him, and started draining fluid from his abdomen! Fluid in the abdomen is always a bad sign. There are 4- 5 different major causes of abdominal fluid buildup, and most of them are fatal! An accurate diagnosis requires, besides the physical examination, a lot of laboratory tests, and in the case of FIP (Feline Infectious Peritonitis) results can still be inconclusive. After some tests, that we could perform on a limited budget, we were left with 2 possibilities. Wet FIP or right-sided heart failure, both fatal and untreatable. Cats with wet FIP usually die within a few days or perhaps weeks, whereas cats with heart failure, with the proper medication, can last longer. 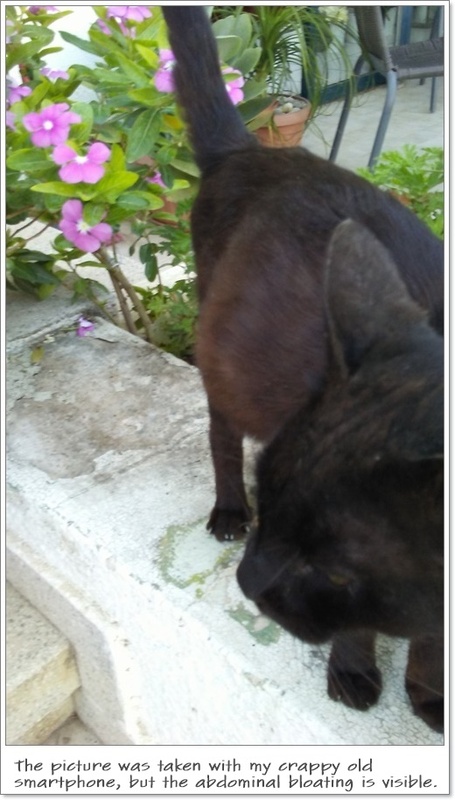 We decided, as long as he did not seem to suffer greatly, and his appetite was still healthy, to place him in my backyard where I could feed and water him properly, plus give him some medication with his food, to ease his bloating condition. The plan worked fine for six days, and Panthera's bloating seemed significantly smaller. His appetite was great, as always, and he seemed to be able to move with more ease. I started hoping for a miracle, even though the doctor was not sharing my optimism. Alas, on the 7th day he just disappeared! At the time of writing this, it's been 4 days and he hasn't yet returned. I am afraid we will not see him again. Nothing, written on this page, should be used as medical advice! ALWAYS CONSULT A VETERINARIAN. This site is supported by JSEcoinBy continuing you agree to donate a minuscule portion of your computers processing power for the benefit of Cyprus homeless cats. This will not impact your browsing experience. Nothing will be downloaded on your device. The script will stop when you leave this site.